Seen and Heard, an art show featuring the work of Lena Rushing and other nationally acclaimed women artists, will be on display at Studios on the Park in Paso Robles from Sept. 28 to Oct. 22, with a reception on Oct. 7 during Art After Dark from 6 to 9 p.m. and an art talk and dinner at La Cosecha on Oct. 18 at 5:30 p.m. ($95 per person, reservations required). Visit studiosonthepark.org for more information. When artist Lena Rushing sat down in January to chat with Sasha Irving from Studios on the Park about her end of the year show, it was clear right away what the theme would be. 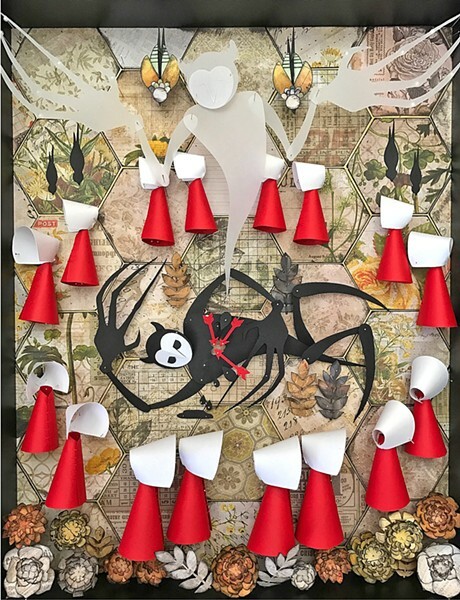 REVOLUTION OF THE HANDMAID Lena Rushing's shadow box piece, Praise Be, is inspired by the book and show, The Handmaid's Tale, and imagines an ending in which the oppressed female characters in that story take their power back. "It took all of a second for us to decide that we'd want it to be about the women's rights movement," the Grover Beach-based artist said. "It felt like a good time in history for a reminder that women have had to fight for rights that should have been inherent all along. It was born a little out of frustration." But Rushing's group show, Seen and Heard, isn't just an homage to the powerful female activists of the past. It's a reminder that following the 2016 election of President Donald Trump and the Women's Marches around the country in January, things like women's health care, maternity leave, and equal pay are all potentially on the chopping block again. The show features the works of eight nationally acclaimed female artists from across the country and will be on display from Sept. 28 to Oct. 22. Rushing looked for artists who work in different media like fiber, yarn, ceramics, and plexiglass and aluminum. 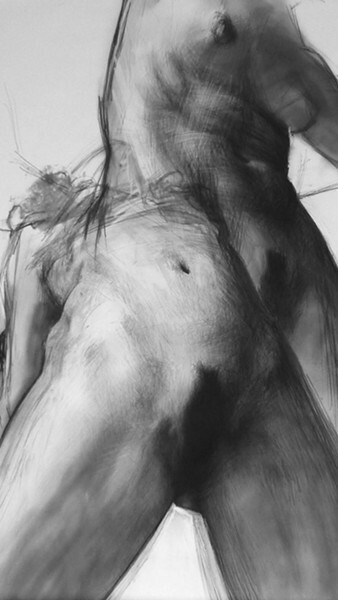 New York artist Gabriela Handal's piece, Self Portrait as a Whore 1, is a captivating 38-by-80-inch tall charcoal drawing that features the torso (from the bottom up) of a woman. The title speaks to the labels and stereotypes that are often thrown on women, but not on their male counterparts. "The movement in it, the giant marks of charcoal, I just love it," Rushing said of Handal's piece. LABELS New York artist Gabriela Handal’s charcoal drawing, Self Portrait as a Whore 1, is a striking representation of the female form, and a reminder of the stereotypes and labels that are put on women, but not necessarily men. One of Rushing's pieces, Praise Be, was inspired by the Hulu show, The Handmaid's Tale (based on the 1985 novel by Margaret Atwood), which imagines a dystopian future where women are stripped of nearly all rights and valued only for their reproductive capabilities. Lena's shadowbox features the paper cutouts that depict the iconic red dressed and white hooded handmaids. The show ends on a cliffhanger, but here Rushing imagines a future where the women take back their power, using her own character Bedlam, a black and white, mischievous creature with owl ears, lying on his back surrounded by the handmaids to symbolize the defeated patriarchy. "I hadn't read Atwood's book before I watched the show and I got Hulu just to watch it," Rushing said. "It startled me and I couldn't get it out of my head. I feel like it told an interesting story and I loved the imagery." Other pieces, like Rushing's Control, speak a little more directly to issues facing women today, like access to women's health care for reproductive services. This multimedia piece emulates a container of birth control, but instead of pills, it holds different baby dolls. Each baby is individually packaged and available for purchase, "so that visitors can decide if they'd like to have a baby," Rushing said. CHOICE? 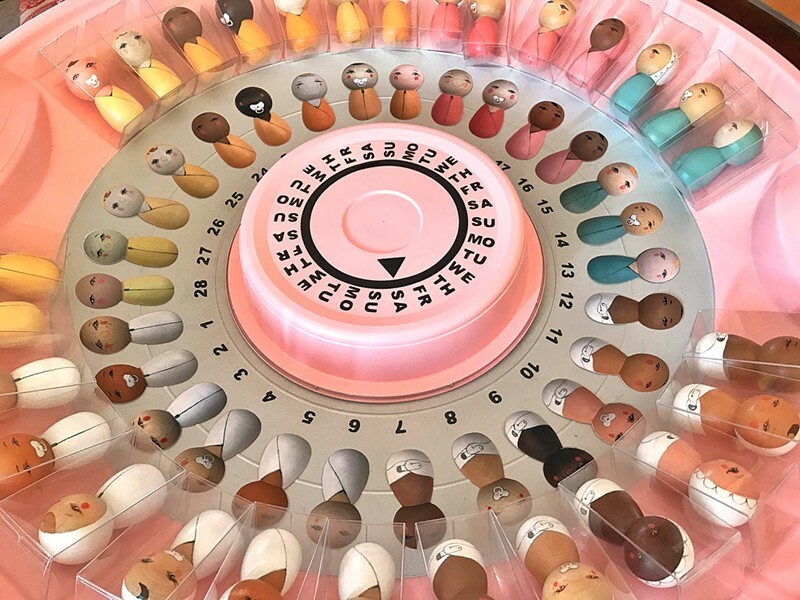 Control by Lena Rushing imitates a container of women's birth control pills, but is filled with baby dolls instead (they can be purchased individually). The piece also makes some nods to the heroes and defining moments of the movement, through portraits of people like Coretta Scott King and Supreme Court Justice Ruth Bader Ginsburg. While the current state of affairs across the nation might seem surreal, Rushing hopes that her show creates a sense of awareness about what can be done. Never the less, she persisted. Contact Arts Editor Ryah Cooley at rcooley@newtimesslo.com.